Welcome. Let's help you get started with PlayVox. At this point you will have received a login user name, typically your email, along with a temporary passcode. This document will provide an overview of the PlayVox platform to ground you on team leader tools. When you first log into PlayVox you are presented with a main dashboard. Your application set may vary. The typical application set for Quality Management includes the Quality application, the Coaching tool set, and the Community Wall. These are presented in the top, main navigation bar. For each application displayed in the top navigation bar, we will display a sub-navigation bar with additional capabilities. More explanation on each application and capabilities later in this document. Moving across the top navigation bar from left to right is a Search function. Free-form type a name and press return to search for a person. To the right side of the top Navigation bar, the bullhorn icon is an announcement function. 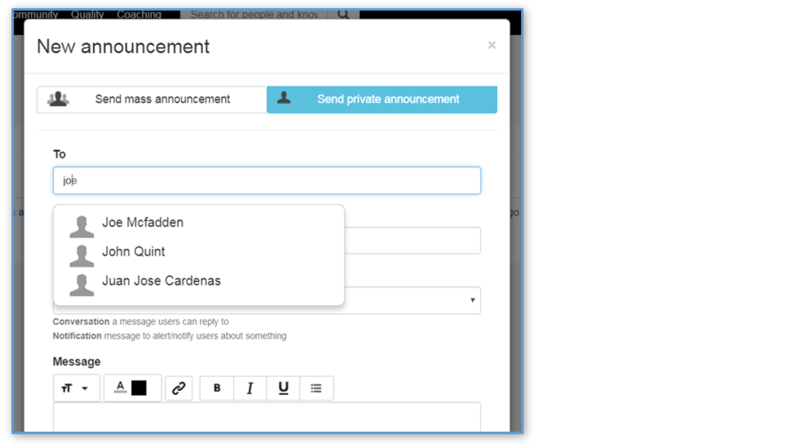 Team leaders and / or administrators can send announcements to teams of people. Click on the bullhorn and click on the green '+' symbol to start a new announcement. 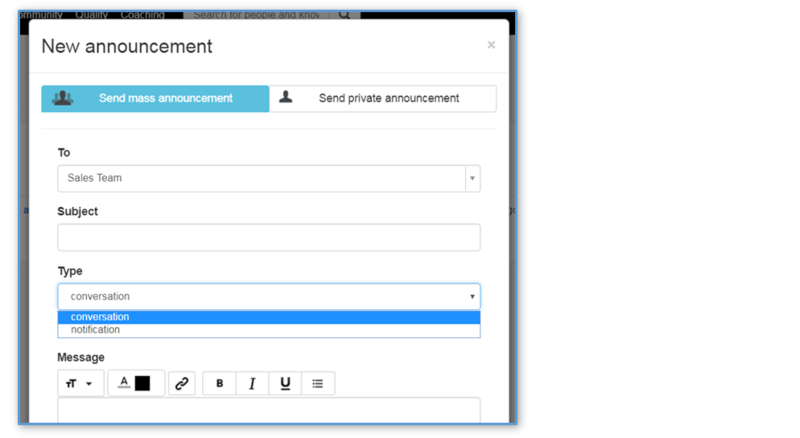 Send mass announcements to a team or teams. Set the announcement for conversation (people can reply), or notification (people cannot reply). Or Send private announcements to selected individuals. Announcements are automatically presented to users upon log on to the platform. Further to the right is a bell icon. This icon indicates a notification. These are generated automatically by the system, typically in response to an action or event. Someone has conducted a quality evaluation on one of your employees. Or a coaching session. A small red circle appears with the number of notifications indicated within the circle. Click on the bell icon to expand the list of notifications. Even further to the right is the question mark. Clicking on this icon provides access to User Documentation in the Help Center. Or you can engage in a live chat with PlayVox support if you have a question. Remember to set your time filter. Note that as you navigate the many dashboards and reports within PlayVox, you will want to indicate the time period for information you wish to access. When searching for customer interactions, historical quality evaluations, or coaching sessions, set the time period of interest. The platform uses the same standardized time filter in the upper right hand corner of the dashboard. Click on the time filter in the upper right hand corner. A drop down window appears. Click on the first field to expose standard time frames for day, week, month, etc. You can also choose Custom to select a preset custom time period. Or choose a date range. 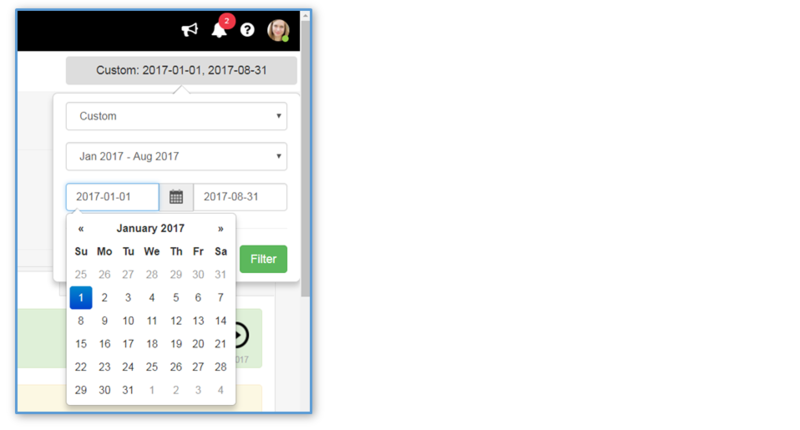 Your platform administrator can create custom date ranges and set the default time setting for these filters. Before you get started, we encourage you and your team members to set up their profile information. This includes uploading a photo image that will be used on dashboards and in communications on the platform. Click on the silhouette image in the upper far right corner of the top navigation bar. 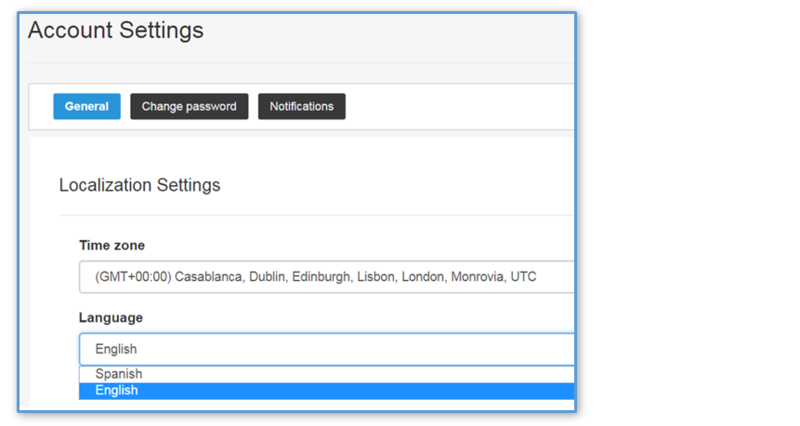 From here you can add profile information and configure your account settings. Select My profile to start. Here, you can provide profile information on yourself to be shared with others. Fill out information as you wish. To update or upload your first photo image, hover over the image and click on Edit profile picture. Next go to Account settings. Click on your profile photo in the upper right. Click on Account settings. Here you can set your time zone, language, and other preferences. Today English and Spanish are the two supported languages. 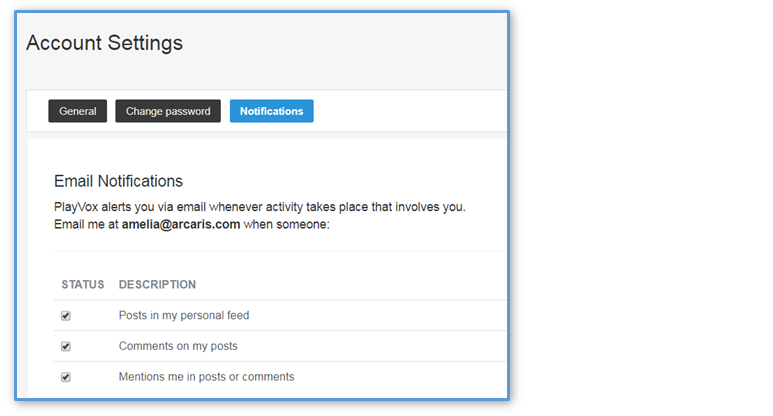 You can also choose to receive and set email notifications of actions on the social Community Wall. The Community Wall is an optional capability and may not be deployed on your site. If your company has deployed the PlayVox Community Wall along with its quality application, you will notice in your profile something called Karma points. These points are associated with levels of use of PlayVox features particularly features on the Community wall. Karma points are awarded and accumulated by users as they perform actions on the Community Wall. But points can also be awarded for completing a quality evaluation, coaching session, or learning module. For a list of actions with assigned points, go to your account photo in the upper right corner of your screen, click on the red heart with Karma points. Then click on How to gain karma on PlayVox. A list of Karma actions and associated points appears. These actions and karma point assignments are set by the platform administrator. Prior to you signing onto the platform for the first time, your platform administrator will assign you a team of individuals. Team designations are filter options and choices throughout the platform when viewing reports and dashboards. Team leaders can be reassigned as changes occur. Likewise, agents can be added, removed, or moved, from team to team by your platform administrator as required. Generally, you will have visibility on only your team members' information. As an example, you will only see coaching sessions that you have conducted or that others have conducted on team members assigned to you. 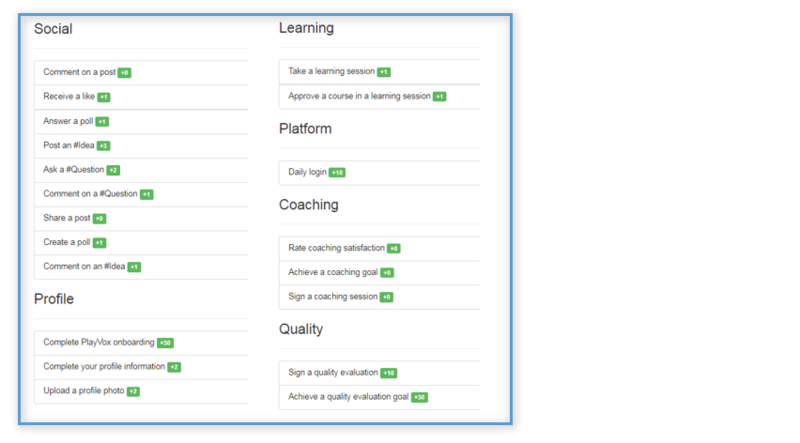 As you see in the My sessions in progress coaching dashboard. For instructions on specific applications and capabilities, go to the following documents. Everything you need to know to conduct evaluations on customer interactions with your agents. Everything you need to know to provide coaching feedback to your agents.